Gurgaon has seen quite a few schools co-opt an International curriculum over the last few years, though most have stuck to offering the choice in senior grades only. With one of Gurgaon’s most coveted school recently announcing the introduction of their International Programme for Primary Years starting from Nursery onwards, we thought it is time to take a closer look! Another two billion people are expected to be added over the next twenty years on earth. New food systems will need to be discovered given the rate at which nature's ability to feed the planet is getting exhausted. New science, architectural and engineering methods need to be discovered to combat the changes in global climate. Many such new discoveries shall need to be made in the world tomorrow in almost all fields. Our students need to be taught in a way for them to learn how to discover! The real world and its issues are a lot more complex than simple unilateral subject area of language, science, numeracy, arts or social sciences. While, a national curriculum such as CBSE continues to enjoy an unimpeded position as a curriculum geared towards competitive examinations, the confines of student performance that is primarily (if not solely) defined by the ability to score on a written examination seems counterproductive to learning to discover. The international curriculum especially during the primary years is a new kind of learning lab. While the basic ingredients (subjects) remain the same – numeracy, literacy, science, social studies and arts; the vessels, tools, recipe, some seasonings and most importantly the palette is what sets an International programme apart. 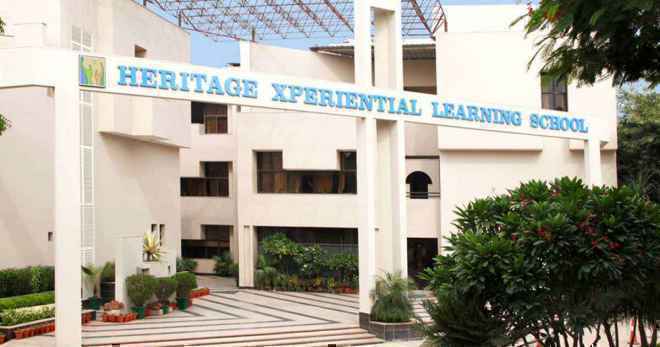 Heritage Xperiential Learning School (HXLS), formerly known as the The Heritage School Gurgaon, has just announced that it is adding the International Primary Programme (IPP) option in its Junior/Primary Years to strengthen its experiential paradigm and extend its global outlook. Unlike other schools offering international curriculums, IPP at HXLS is structured very interestingly in the sense it blends more than just one standard. Let’ see how. We probed further for an example to understand how this would look like in action and Amy obliged. “For example, instead of just cramming facts on a topic like ‘Water’ and how it relates to a student’s life in the local context of India, students in the International Primary Programme discover the impact Water has in various settings and communities around the world. Furthermore, using the understanding of global challenges and solutions around the topic students engage in producing things of real purpose to be used by an organization beyond the school. Like in the instance of Water, they could possibly work on projects such as rainwater harvesting models, water preservation techniques, understanding and finding solutions for water logging, improved drainage, reasons & impacts drought & floods, etc. The audience for a student is way beyond their classroom teacher or the confines of a physical classroom” explains the HXLS IPP Head and experiential learning veteran from the United States. Schooling decision, a difficult enough choice for parents, is worsened by the fact that education with a global outlook has become a much abused phrase with majority of schools claiming to be offering all benefits by adopting an international curriculum. So what sets a “good” International school esp. during primary years apart? Let us explain with an example - There is a difference between celebrating a commercialized international festival such as Halloween in a school to keep up the international façade vis-à-vis actually developing an understanding and appreciation in students for different International cultures & perspectives with a constant eye on global achievements in various fields and how to learn from them. A true international program focusses on the latter. We feel it is the ‘right’ delivery of a chosen international curriculum supported by aligned teachers, instructional setup, resource material, supporting infrastructure & a genuine international outlook, more than the actual choice of the international curriculum itself is what defines a good International program. Having said that, IPC and PYP are the most popular choices in International schools today for primary years – both being inquiry based approaches with IPC originating in the UK and PYP originating in Switzerland. So is there a difference between these curriculums – Of course but less significant from a parent’s perspective as the major difference lies for schools implementing them. For example – IPC provides a philosophy & framework along with curriculum units for teachers to work with and further strengthen, compared to PYP that requires conformance to set standards and instructional philosophies but most of the actual curriculum resources need to developed by individual schools themselves. The playing field is indeed fast becoming global, given the international mobility today esp. among people of Indian origin – Sundar Pichai (CEO of Google), Indra Nooyi (CEO of PepsiCo), Satya Nadella (CEO of Microsoft), Ajay Banga (President & CEO of MasterCard) being some of the more famous examples to make the point. So does an International Primary Program give our young children the sure start needed? We sure think – its worth for you to explore the power of a young mind that learns to discover in a global setting!